So it's been awhile since my last post, but wanted to get this review out before the madness of AU next week. 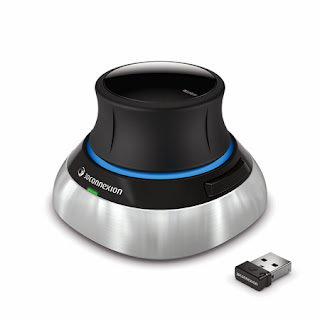 I've been testing the new 3DConnexion SpaceNavigator Wireless and have to say its a great little tool. There are a few new features that make it worth looking into. Firstly, it's wireless which makes it great for presentations with a laptop or for crowded desk space. It has a built in lithium battery that charges through a USB cable that can be unplugged after charging. I found that it takes roughly 2 hours to fully charge. But I also found that a single charge can literally last for weeks without having to turn the device off, and with daily use....I was quite impressed with that. Secondly, the base itself seems heavier than before which makes it easier to navigate without having the base slide around while spinning around. Also, with the new driver the mouse seems to be more sensitive while navigating which makes it easier to move around in less time. I found it works great in 3dsmax and SketchUp. There is an interesting pop up in SketchUp when navigating in orthogonal mode, but simply converts back to perspective mode. If you don't have a 3d mouse, this is definitely the one to get. If you'd like to learn more, check out 3dconnexions webpage on it. HI Ramy, Do you actually use this to work or just for presentations? I tried using mine to model in max and found it very annoying. Now, I only using for presentations. If i'm working on lighting and materials and have to move around a big scene alot, it really saves alot of time getting just to the right spot in the model. Not so much for modeling, but just moving around my scene.